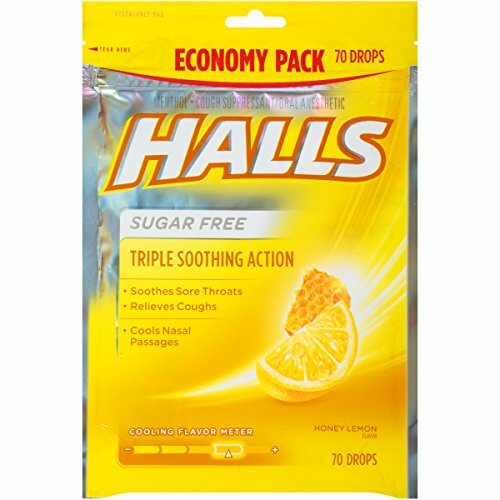 Halls Advanced Vapor Action Honey Lemon Drops Bonus Bag -- 3 per case. 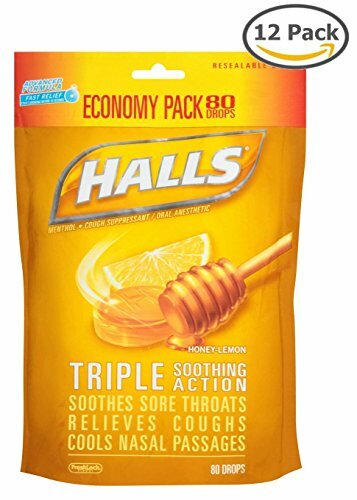 Halls Honey Lemon - 9 peice stick, 480 per case Halls is fast effective relief that starts working within 10 seconds. 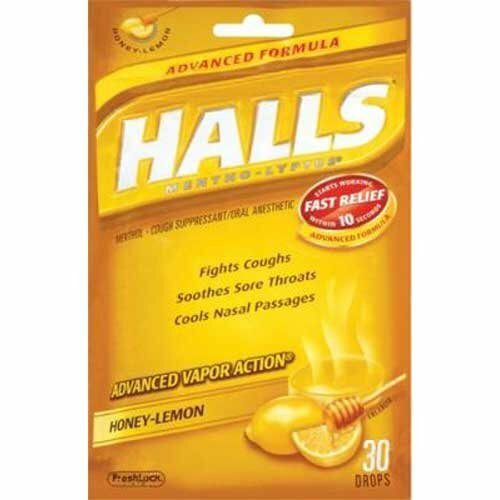 Halls fights coughs, soothes sore throats and cools nasal passages with Advanced Vapor Action formula. Only 15 caloreis and 4 grams of carbohydrates per drop. Ricola honey-lemon combines soothing honey with the rich flavor of natural, herbal lemon balm and echinacea extract. These natural ingredients work in harmony to bring soothing relief to sore throats. Ricola derives its unique lemon flavor from natural, herbal lemon balm, giving it a rich, pleasant taste. Echinacea is an herb that has been used for centuries to help fight symptoms associated with colds and flu. Recent studies suggest that echinacea helps to stimulate the immune system, strengthening the body's natural defenses. 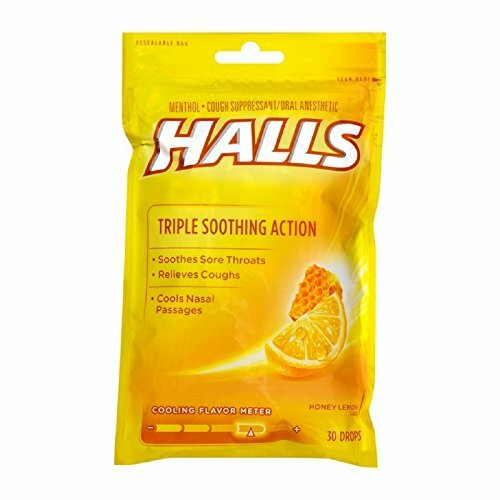 Enjoy this classic HALLS Cough drops in Honey-Lemon flavor.HALLS fights coughs, soothes sore throats, and cools nasal passages. HALLS are formulated with Advanced Vapor Action for fast, effective relief that starts working within 10 seconds. Here to rid the world of irritations, one cough and sore throat at a time. 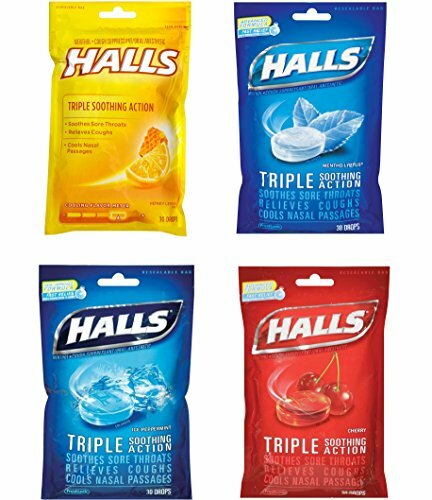 Whether it is a scratchy throat or a cough that won't quit or if you just want something to help you boost your immune system, HALLS has you covered. HALLS provides fast, effective relief that starts working within 10 seconds. 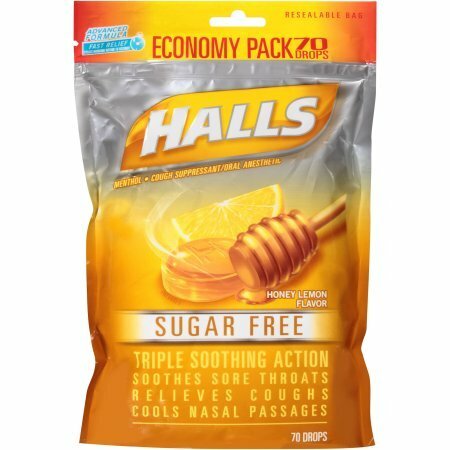 You can enjoy HALLS in a variety of flavors, including sugar free. 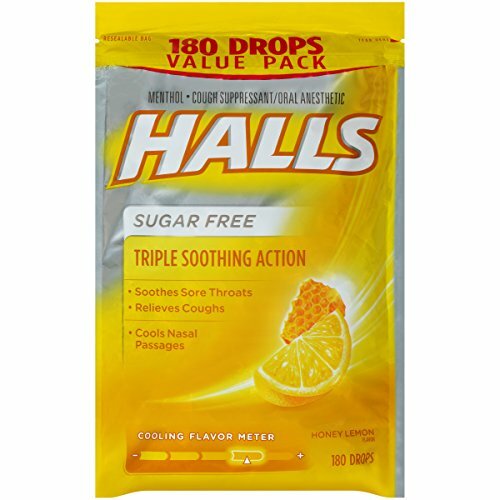 Shop the entire HALLS selection and find the HALLS that suits your needs. Cools nasal passages; Soothes sore throat; Fights coughs. Advanced vapor action. FreshLock Zipper Resealable Bag. No other brand brings you our patented Advanced Vapor Action formula. Halls with Advanced Vapor Action goes to work immediately to fight coughs, soothe sore throats and make nasal passages feel cooler. 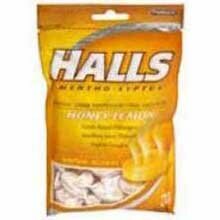 Halls - a trusted name throughout the world. Dependable quality and value for over 100 years. Calorie Contents: 15 Per Drop. Linx Vapor ARES Honey Straw Review. MmmMm!